Take a walk along the Main Yarra Trail, from Plymouth Street near the tennis courts, over Banyule Creek, past the Native Gardens and the Banyule Flats sports grounds. You get fine views of Banyule house, perched on the hill above the flood prone river flats. Swamps are a haven for birds. The occasional tiger snake slithers across the path. Now take a sharp right and cut back across the paddocks towards Banyule House. Occasional old fence posts and gates can still be seen. At various points, you cross drainage channels, some still lined by the remnants of introduced shrubs. A group of deciduous trees cluster near the river bank. A tumble down collection of cattle yards and sheds confronts you, just before you return to the tennis courts. 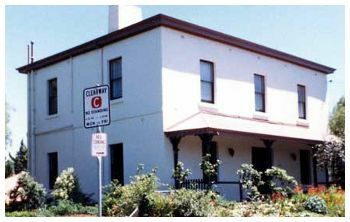 Driving along Heidelberg Road towards the City of Melbourne, an old building with the strange word "ZIMBLER" on a sign near the front door, can be seen on the right, just before you cross Darebin Creek. In 2006, it was owned by an electronics company. You would hardly guess that it was one of the earliest hotels in the district, the famous Darebin Bridge Hotel. "D.A. Bulletin No. 121, June 1965". OLD DAREBIN HOTEL AND FAIRY HILLS. Cleveland was a property to the east of the earliest area of land sold in the Heidelberg area. It was purchased by George Porter in the 1838 land sales. The article describes the work of Mr. Joseph Bond who was the tenant of Cleveland for 35 years by 1894. Source: The Australasian, No. 1469 Vol LVI, Melbourne Saturday May 26th 1894 - Price 6d. Page 890. 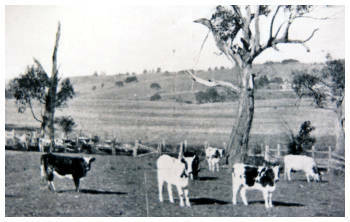 Along the banks of the Yarra, in the neighbourhood of Heidelberg, there are a great number of milk farms, where the sole object is to produce milk for the Melbourne market. 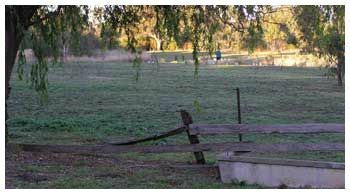 For a considerable distance up the Plenty River, which joins the Yarra two miles above Heidelberg, there are also several such farms, and to describe one describes them all, so far as the system and method of working are concerned. One milk farm differs from another chiefly in the breed or character of the cattle which are preferred, but the routine of management in any particular district is very similar, as a rule, for the reason that certain lines must be followed, there being no option for the farmer to vary his system to any great extent. A collection of articles from newspapers, Government Gazettes and other sources have been selected to illustrate different aspects of Heidelberg life, especially in the nineteenth century. These will be added to regularly and updated as more resources come to light. For those interested in such subjects as the 1838 land sales, Banyule in the nineteenth century, court cases, electricity and railway services for example, these would make interesting reading. An example or two of such material is given below in order to provide some idea of other items to come. What might have been a serious conflagration but for the timely intervention of the local contingent of the fire brigade, occurred at Heidelberg on Monday afternoon. A fire started in a paddock owned by Mrs. James in Brown-street. A thick growth of sub dried furze created a great blaze, which, aided by a strong north wind, rapidly traveled to Cape-street, and attacked the fences dividing the properties of Messrs Withers, Wardrop and May. 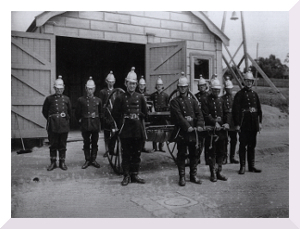 The Tenements in Cape-street were in danger, when the brigade, under the charge of Mr. Davey, arrived. About 1000 feet of hose was run out, and the fireman in a remarkably short space of time had the flames under control. No material damage was done. This morning there was a sensational smash-up of vehicles in Burgundy-street, Heidelberg, when a phaeton, drawn by a grey pony, and belonging to Mr Cameron, of Eaglemont, bolted from the local railway station. The frightened pony galloped down Burgundy-street and collided with a fruit wagon, owned by Mr Ely, of Greensborough. 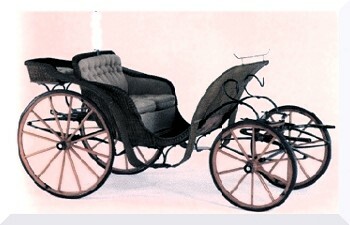 The shafts of the wagon were smashed off, and the phaeton parted in the centre the panic stricken pony continuing its mad career with the fore-carriage until it dashed into a dray belonging to Mr Walters. This second collision rid the animal of most of its encumberances, and it was ultimately captured by Mr W. Inglis in the Heidelberg park. HOW LONG DID THEY REALLY TAKE? Train travellers from Melbourne to Heidelberg in 2016 will be familiar with the little stations between Flinders Street and Clifton Hill. 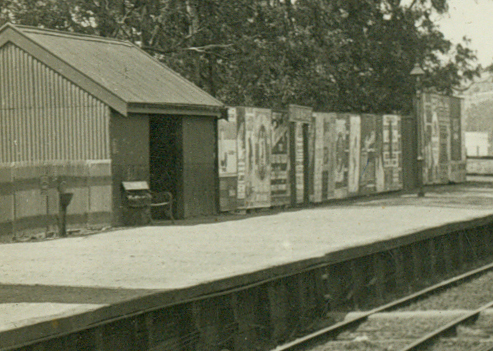 These include Jolimont for the MCG, West Richmond on the curve, with the big gap between the train and the platform and Victoria Park, the old home of the Collingwood Football Club. Before 1901,the train did not go that way. It went on a northerly route around the old Inner Circle. It was suggested that horse and buggy from Melbourne could reach Heidelberg more quickly than the train going by this roundabout route. Based on information from the Mercury and Weekly Courier, the attached detailed timetable information gives evidence of the actual official times in 1890. Free for Members and Children under 16. Meetings are held on the second Tuesday of every second month throughout the year. are acknowledged for the following article about an 1843 Land Sale in the Heidelberg Area. Has received instructions to sell by auction at his rooms, on WEDNESDAY, January 4, at one o'clock, A BEAUTIFUL farm, containing one hundred and seventy-three acres, one rood and twenty-three perches, the greater part of which is under crop, and is fenced in with a substantial post and rail fence; the government high road to the Plenty district passes through this property, nearly at its northern boundary; and on the south it is bounded by the government road leading to Heidelberg. The greater part of this homestead is cleared and under crop. A draw well has been sunk producing an abundant supply of water. The soil is a rich black vegetable deposit and from its great depth seem inexhaustible. The auctioneer would most respectfully remind the wealthy proprietary in that neighbourhood to whom this advertisement is addressed, that there has been a judicious avoidance of all remarks of a puffing nature, facts alone having been adduced. Thousands of photographs are available to view in the Heidelberg Historical Society Museum. You can visit on a Sunday afternoon between 2pm and 5pm.